Dr. Cobb, a semifinalist in the Third International Van Cliburn Piano Competition, is an international performer and recording artist known for his broad interpretive range and technical command. Dr. Cobb studied with Claudio Arrau, whose teacher was a pupil of Franz Liszt. Throughout his career, Claudio Arrau (1903-1991) was renowned throughout the world as one of the supreme keyboard masters of the century. Franz Liszt was a student of Carl Czerny, who was a pupil of Ludwig van Beethoven. Christopher Tavernier made his debut as a concert pianist in Rocky Mount, North Carolina at the age of thirteen, performing Tchaikovsky’s Piano Concerto No.1 in B Flat Minor with the Tar River Philharmonic Orchestra. Christopher’s first love is the piano. He began his studies at the age of six and is now realizing his dream of becoming a great concert pianist. 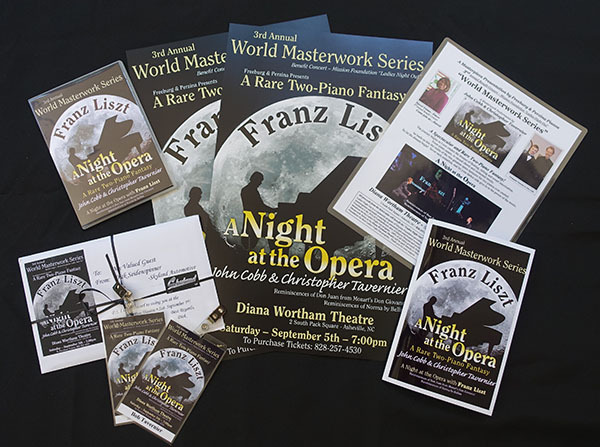 Although Christopher knows and loves a whole vast of piano repertoire, Franz Liszt is his favorite composer. Franz Liszt was probably the greatest pianist who ever lived. He is considered one of the greatest composers of the Nineteenth Century. Among his many innovations was the invention of the solo recital and the development of the symphonic poem. Christopher’s repertoire contains many works by Franz Liszt, of whom he is a direct musical descendant through his teacher Dr. John Cobb. Hence the musical lineage actually extends from Ludwig van Beethoven to Christopher Tavernier. Studying under Dr. Cobb and performing concerts, together, they continue to “Preserve the Musical Lineage of Franz Liszt." The journey begins as Liszt creates the dreams of floating, falling and sweet intoxication. From piano music, to sacred choral and orchestral music, he leads us into the realm of the two greatest opera fantasies for two pianos ever created. So let the dreams begin! Savor each sensation, and let your darker side give in to the power of the music of "A Night at the Opera"
Video / Audio Footage - Full Length DVD will be available!